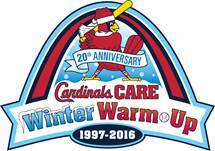 ST. LOUIS, November 23, 2015 – Cardinals Care, the charitable foundation of the St. Louis Cardinals, announced today that tickets for the 20th annual Winter Warm-Up (#CardsWarmUp) will be available starting Friday, November 27 at 10 a.m. CT. One of the most popular fan events in baseball, Winter Warm-Up takes place Saturday, January 16 through Monday, January 18, 2016 (Dr. Martin Luther King Jr. Day), at the Hyatt Regency St. Louis at the Arch. The event times are 9 a.m. to 5 p.m. on Saturday and Sunday, and 9 a.m. to 3 p.m. on Monday. Beginning Friday morning, fans can purchase admission passes for the three-day Winter Warm-Up online at cardinals.com/winterwarmup, in the official Cardinals Team Store at Busch Stadium and at Cardinals Clubhouse stores located around St. Louis. Those who order online by January 4 will receive their passes in the mail. Fans who order on/or after January 5, can avoid the Will Call lines by picking up passes at the Busch Stadium ticket windows Monday, January 11 through Wednesday, January 13 from 10 a.m. – 4 p.m. Will Call opens on Friday, January 15 at the Hyatt Regency. The prices for admission passes, which are valid for all three days of the Warm-Up, will remain the same as the last few years – $40 for fans age 16 and over, $10 for children age 5 to 15. Kids under 5 are admitted free of charge. Members of the military, police and fire departments with an active ID can receive one free adult pass which must be obtained in person at the Official Cardinals Team Store at Busch Stadium (November 27- January 15) or at the event. Winter Warm-Up provides fans with countless unique opportunities while raising money for Cardinals Care, the team’s charitable fund whose mission is caring for kids in the Cardinals community. Fans can meet their favorite players at autograph sessions, play interactive games, share memories with Hall-of-Famers, take photos with Fredbird, find collectible memorabilia, bid on one-of-a-kind items at live and silent auctions, experience live presentations, and ask tough questions of players, owners, scouts, broadcasters and officials at Q&A sessions. Many players’ autographs are free with the admission pass, while others require an autograph ticket available through a specific additional donation. All autograph tickets will be sold online beginning Tuesday, January 5 through Sunday, January 10. Fans can visit cardinals.com/winterwarmup in mid-December for details, including player autograph dates, times and, if required, additional donation amounts. Any remaining autograph tickets not sold online will be available at the Winter Warm-Up. For complete event details, schedule and frequently asked questions, visit cardinals.com/winterwarmup. Cardinals Care was established to give fans a way of teaming up with Cardinals players and the organization to help children in our community – both on and off the baseball field. Since it was established in 1997, Cardinals Care has distributed over $21 million to support St. Louis area non-profit youth organizations and built 22 youth ball fields in local under-resourced neighborhoods. 2015 marked the 12th year of Cardinals Care’s innovative Redbird Rookies program, a free baseball league for kids who otherwise might not have the opportunity to play. In addition to providing all the uniforms, gloves, bats, balls and other equipment needed for each team, Redbird Rookies also provides extensive off-field support in the areas of health, education, mentoring and the cultural arts for each of the nearly 4,500 kids who participate in the program each year.